The town of Weligama lies on the south coast of Sri Lanka between Galle and Matara. Volunteers have been associated with this town since 2005. In 2009 it was ‘home’ for a team of MBA students who came to study the local cinnamon industry and other teams and individual volunteers have spent time here in subsequent years. 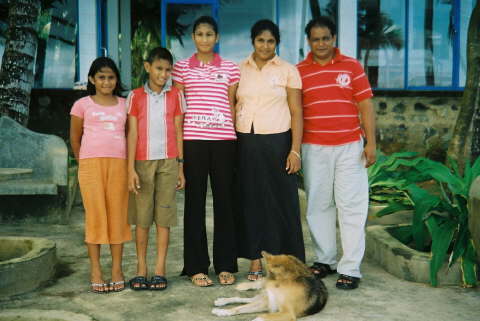 Jagath, host of our MBA Team, with his wife Chandi, daughters Jayani and Jayahsa and son Janith. As with all of our villages, subsequent teams and individual volunteers maintain our links with the town and schools of Weligama, notably Sri Sumangala College for Girls and Siddhartha College for Boys. Weligama is also the ‘home’ of our child sponsorship scheme which is detailed on other pages of this website. Trustees regularly stay in Weligama and meet children supported by this scheme.